. : Optics & Photonics Focus :: Hot Science Below Absolute Zero :. A temperature portrait. 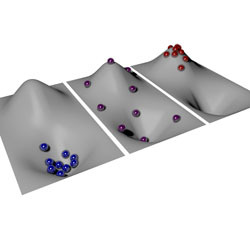 The thermal (Boltzmann) distribution can be illustrated with balls distributed on a hilly landscape. The landscape provides both a lower and upper bound for the potential energy of the balls. At positive temperatures (left figure), common in everyday life, most balls lie in the valley around minimum potential energy. They barely move and therefore also possess minimum kinetic energy. States with small total energy are therefore more likely than those with large total energy — the usual Boltzmann distribution. At infinite temperature (central figure) the balls spread evenly over low and high energies in an identical landscape. Here, all energy states are equally probable. At negative temperatures (right figure), however, most balls wander on top of the hill, at the upper limit of potential energy. Also their kinetic energy is maximal. Energy states with large total energy are occupied more than those with small total energy — the Boltzmann distribution is inverted. Image: LMU/MPQ. What is temperature? The standard answer is that temperature is a measure of how much particles are moving. For example, zero Kelvin, the absolute zero, corresponds to the temperature at which particles do not move at all. Can there be a negative temperature? Can particles move less than nothing at all? Surprisingly, negative absolute temperatures are allowed by the equations describing thermodynamic phenomena. Until recently, however, this was largely discarded as an almost purely theoretical possibility. Be that as it may, a group of researchers led by Ulrich Schneider, from Ludwig Maximilian University in Munich, Germany, has now experimentally achieved negative absolute temperatures, opening the door to new quantum devices and maybe even to uncovering some cosmic mysteries. Tiny bouncing billiard balls are commonly used to illustrate how gas particles behave. The more agitated they are, the higher their average speed, and thus the higher their average kinetic energy. Following this intuition, temperature is often defined as a measure of the average kinetic energy of these particles. A more subtle way of looking at temperature is by observing how a system becomes more disordered as we add energy — this disorder is called entropy and plays a key role when studying large numbers of microscopic particles. Temperature is therefore related to the amount of entropy increase as more energy is pumped into a system. To be exact, temperature is defined as the inverse of this ratio of entropy increase per energy increment. The two definitions are clearly related: the more vividly the particles bounce, the higher their kinetic energy; the colder the gas, the less the kinetic energy of the particles. What is negative absolute temperature, then? Is it possible to pump energy into a system of particles in order to get them more ordered? In our everyday world, of course, this cannot be done. This is why such a possibility was discarded as a purely theoretical scenario by many scientists in the past. Achieving negative absolute temperatures required seemingly impossible experimental control over gas particles. Schneider and his team have, nevertheless, created negative absolute temperatures in their laboratory. "Intuitively speaking," Schneider explains, "gas particles — the tiny billiard balls — bounce off of each other." An ordinary gas can be visualized as made of tiny billiard balls trapped in one large valley: the more agitated the particles are, the higher up the sides of the valley they can climb, and at temperature zero, they all fall to the lowest point in the valley. Using ultracold gases, Schneider and coworkers were able to achieve tremendous control over the behavior of the gas particles. They were able to create a situation in which the particles experienced the effect of the large valley plus the effect of additional laser fields that affect their possible kinetic energies. Furthermore, they were even able, with the flick of a switch, to turn particles that would bounce off of each other into particles that attracted each other. So how would particles experience positive and negative absolute temperatures? "In our experiment," Schneider explains, "particles at positive absolute temperatures are in a potential valley, trying to get away from each other. The more we cool them down, the closer they get together, and the lower their energy is. To achieve negative absolute temperatures, we invert everything: the particles are suddenly put on a mountain top and attract each other. Thus, by increasing the energy, they get closer together and on average closer to the summit. And since the summit is a high energy state, this means that cooling the particles down leads to a higher energy of the system." "The fact that this could be done is remarkable," Achim Rosch  from the University of Cologne, in Germany, says. "Temperature is one of the most fundamental and powerful concepts in science. Showing that negative temperatures are accessible with ultracold atoms is, therefore, like opening a new window. The view out of this window is fascinating as matter at negative temperature has many counter-intuitive properties. For example, the system has negative pressure: to hold the atomic cloud together, you need forces, which try to tear it apart. Or, to be a little more abstract: normally, when energy is added to a system, the amount of disorder (i.e. the entropy) increases, but here the opposite happens: the system becomes more disordered when energy is removed. A consequence would be that, in principle, new types of small machines can be built, using reservoirs of negative temperatures." "The fascination," Rosch summarizes, "stems from the fundamental importance of the concept of temperature. And the strange properties of negative temperatures make this especially exciting." And he concludes: "With ultracold atoms physicists have reached an amazing amount of control on matter: a manipulation on an atom-by-atom basis of not only a few, but of a large number of quantum particles has become possible. The experiment is a good example of how it is now possible to engineer new states of matter in completely new ways. In the long run this will also help us understand the properties of new materials (which will also have a serious technological impact) or help us to build new types of computers with properties rooted in the quantum world." A. Rapp, S. Mandt & A. Rosch, Equilibration rates and negative absolute temperatures for ultracold atoms in optical lattices, Phys. Rev. Lett. 105, 220405 (2010). AN is a Visiting Scholar at Hewlett Packard Laboratories in Palo Alto, California, USA. His research focuses on quantum optics, modeling of nano-photonic devices, and numerical optimization. S. Braun, J. P. Ronzheimer, M. Schreiber, S. S. Hodgman, T. Rom, I. Bloch & U. Schneider, Negative Absolute Temperature for Motional Degrees of Freedom, Science (2013) 339, 52-55 (link).